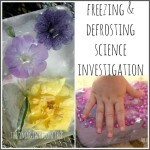 Playing with ice is an absolute favourite sensory and science activity for small kids to explore! 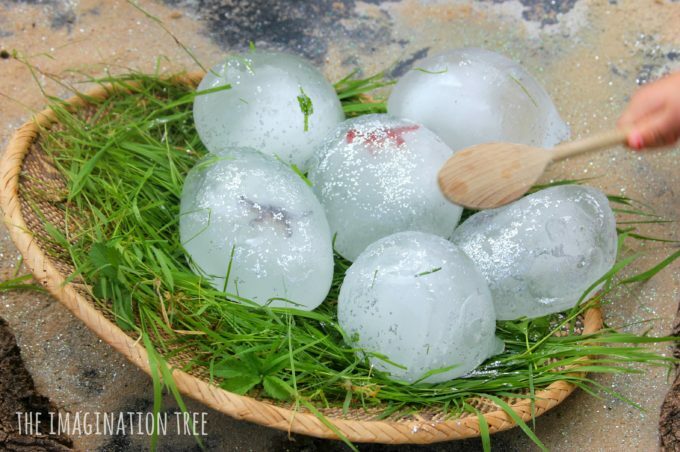 We have often enjoyed freezing and thawing objects, trying to work out how to release them from the ice blocks and cooling down from the heat of the day in the process! 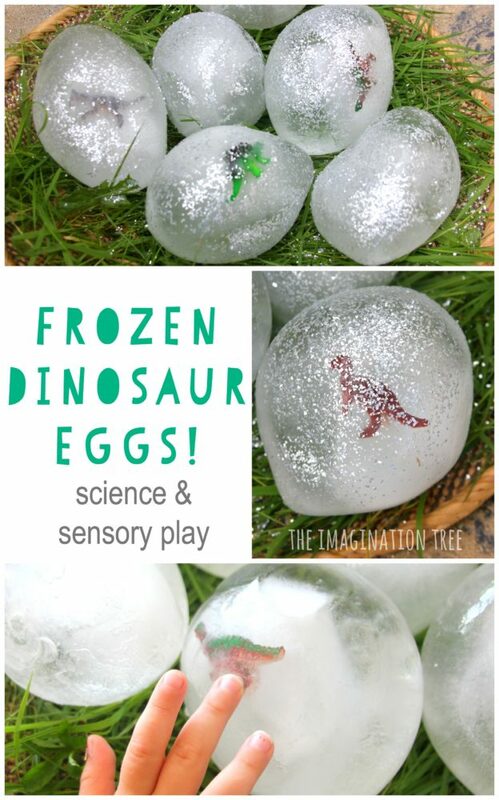 This time we decided to make some super cool dinosaurs frozen inside ice eggs for a fun twist! Once out of the balloons they look AMAZING! We sprinkled each one liberally with lots of silver glitter to make them even more magical and other-worldly. 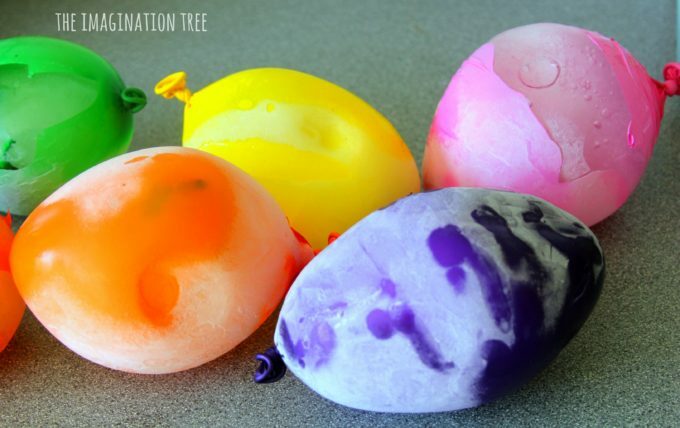 Each egg could have a different colour too! This is a fabulous problem solving activity to set up in the classroom or home with the question: “Oh no! 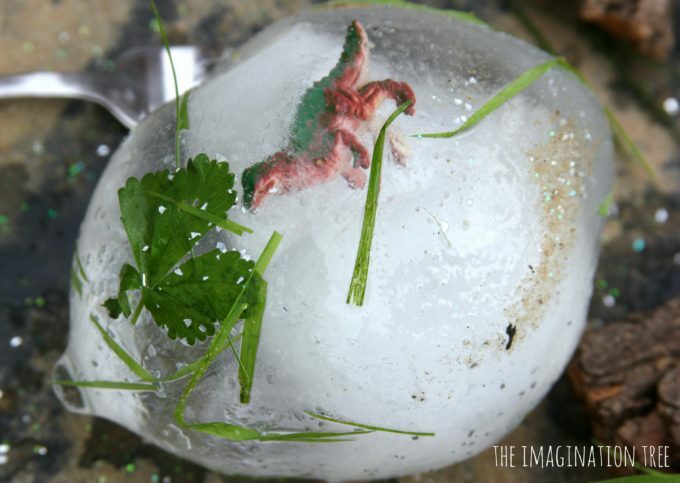 The dinosaurs are trapped in the ice eggs. How can we help them to hatch out? 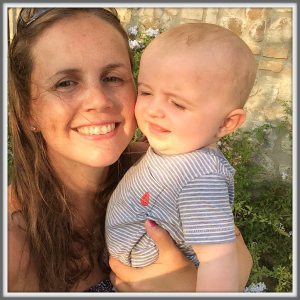 !” You can ask children to get into groups and try and come up with some methods and materials they might need, then see what they try out. We had some playmates over so in the end there were about 7 kids playing with these and they came up with great suggestions! 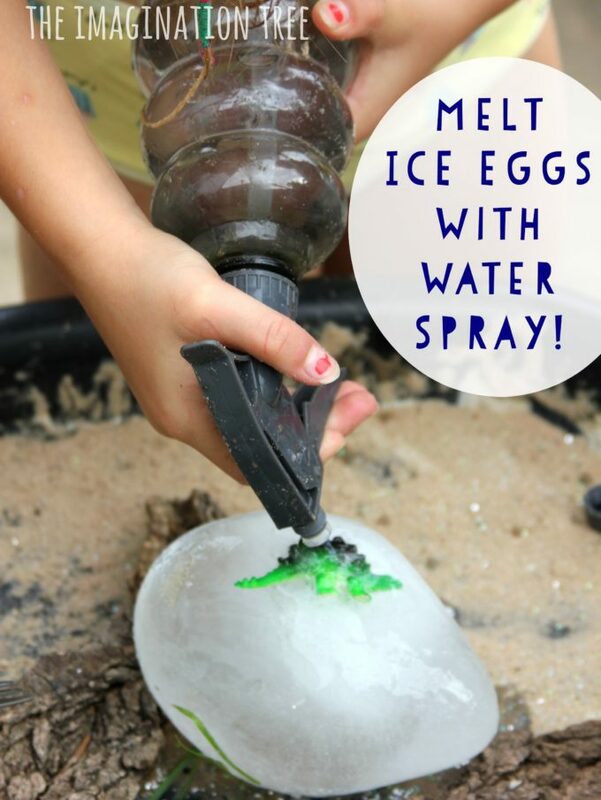 They used wooden spoons, forks, rocks and other items for bashing, but quickly remembered that the best thing for melting ice that they discovered last time, is water! 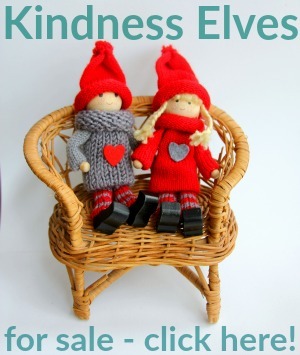 They helped themselves to bowls of water, paintbrushes and spray bottles and began the attack! 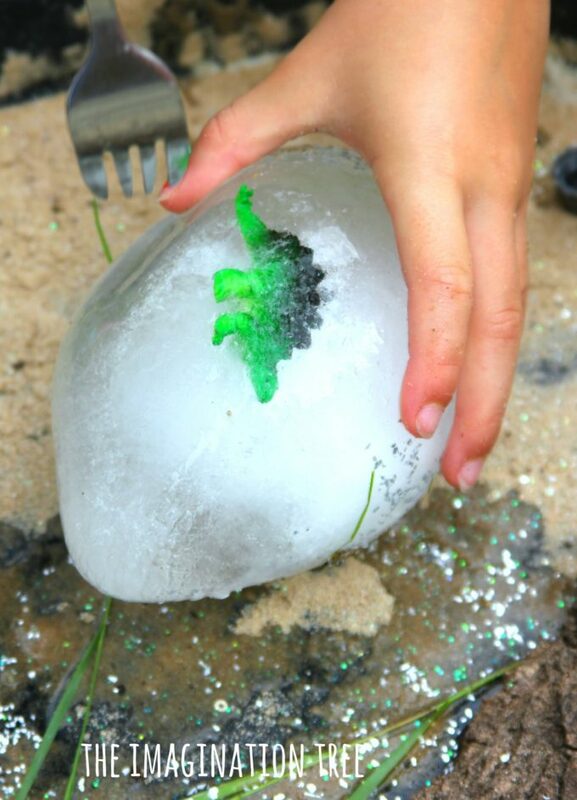 It wasn’t long until the first dinosaurs started to emerge from their frozen eggs, amidst whoops of triumph! 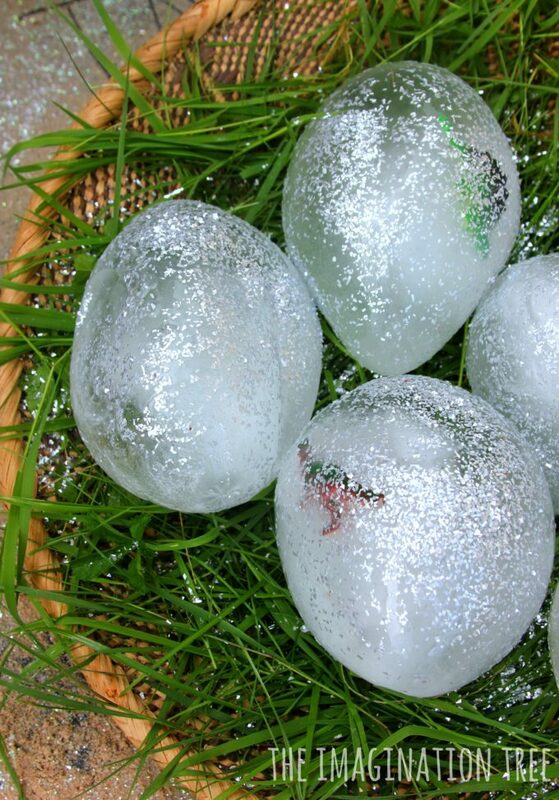 Once they were freed they continued to work away at the ice eggs, chiselling and melting them down to small blocks. 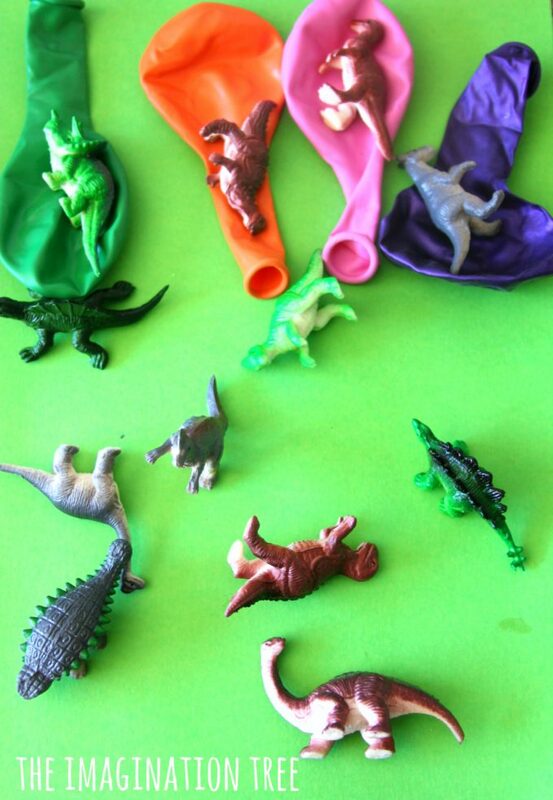 Then the dinosaurs were used in small world imaginative play! For younger kids they’d be great to hide in the undergrowth or inside a (insulated) box to open up and surprise them for a bit of awe and wonder! Play with them after reading some favourite dinosaur story books or use them as a story telling prompt together, inventing a part each. 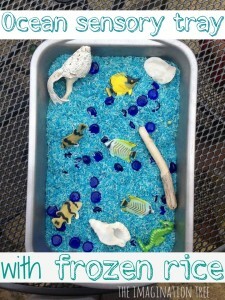 Or simply set them out as part of a sensory table or small world scene alongside some basic tools and spray bottles and wait to see what they make of it. Let us know how you choose to play! 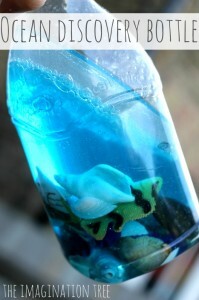 And please do check out all our PLAYFUL SCIENCE ideas here too. « 20 Great Toddler Meal Ideas! This looks so fun. 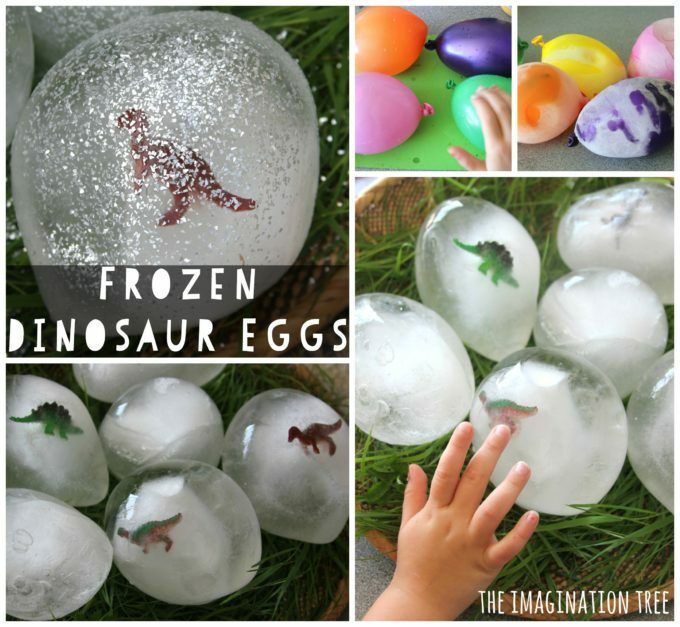 I just ordered a set of the dinosaurs for my grand daughter and plan to use this idea for her enjoyment next weekend!